Known for providing innovative drinking water solutions for the plumbing industry, German-Swiss company NEOPERL offers products that shape the water stream, regulate the flow rate and protect drinking water. Since the company was founded in 1959, NEOPERL has expanded the business to over fifteen countries worldwide and is still growing to this day. 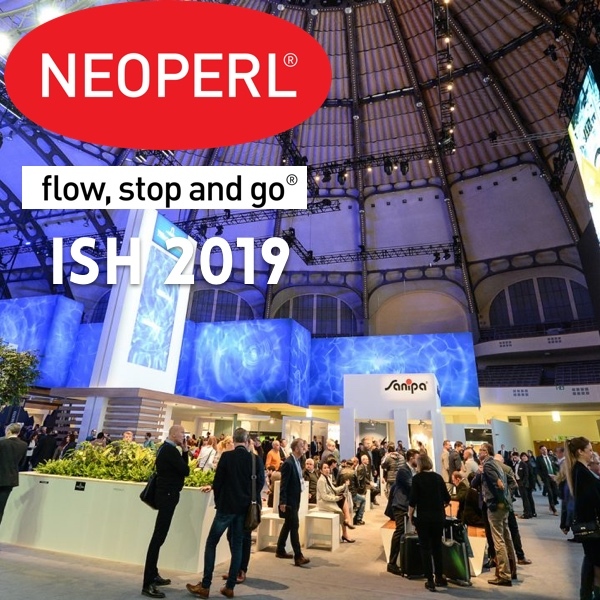 When planning for the ISH 2019 show in Germany, NEOPERL wanted their booth to accurately and effectively portray the company message and history, while also incorporating an interactive element for guests. 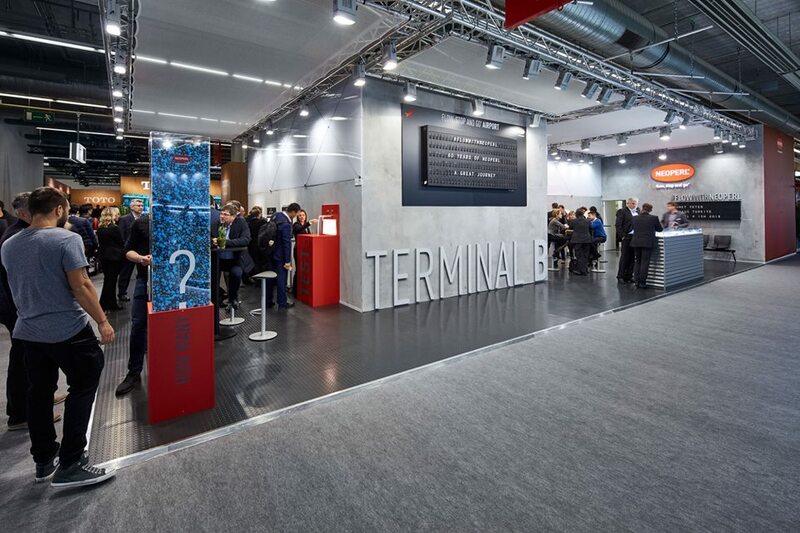 To tie each of these elements together, NEOPERL incorporated a travel theme into their booth design to help showcase the company’s worldwide presence and growth. Because of the nostalgic sense of travel that comes with the Split Flap and the smart capabilities of Oat Foundry’s display’s specifically, NEOPERL enlisted our help. We built one customized display and provided one rental to incorporate into their ISH booth. The first display, a 6R x 32C Split Flap rental, sat front and center in their booth at the show. Using the Split Flap web-based application, the display presented pre-programmed information about NEOPERL’s expansion over the years – showing countries and the year that they started doing business there. 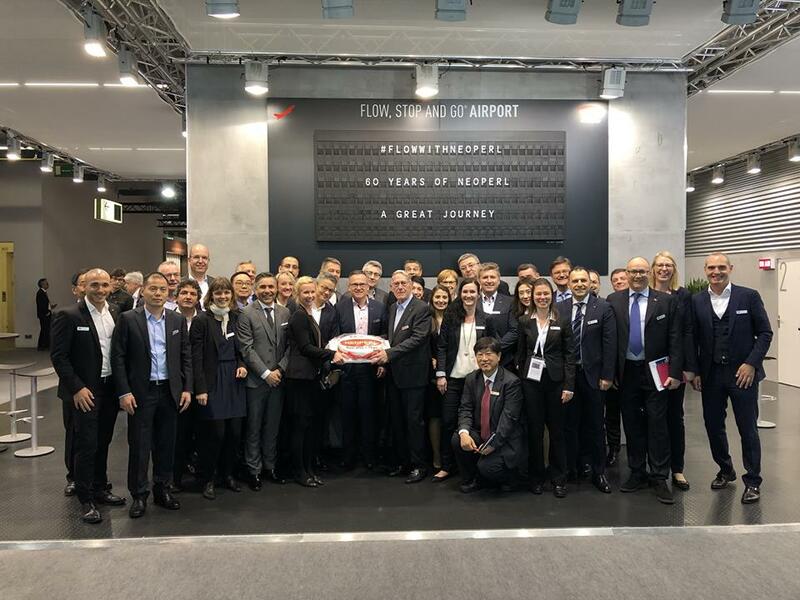 The Oat Foundry Split Flap allowed NEOPERL to present the company’s history and progress to booth visitors, while also aesthetically tying it back to their travel theme. 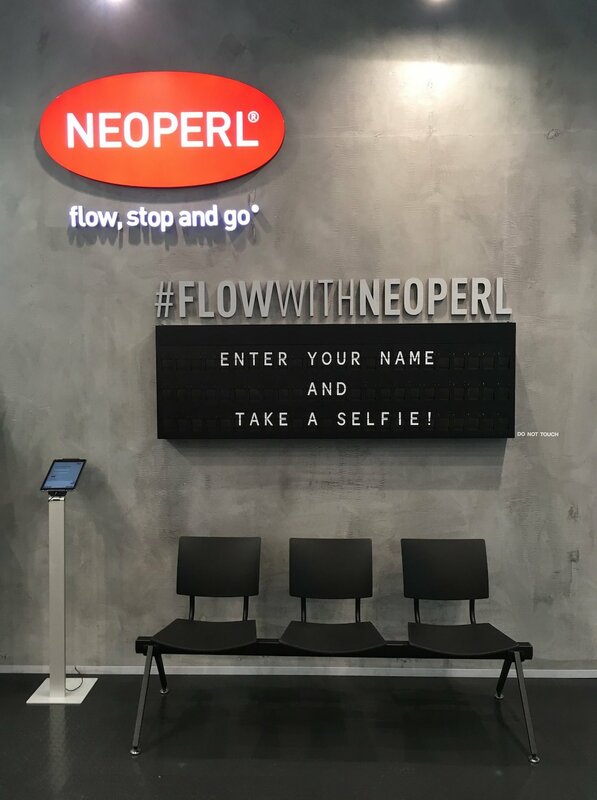 The second display, a custom 3R x 24C Split Flap, acted as a fun, interactive, travel-themed “selfie station,” which sat above an airport waiting area themed set-up. To allow guests to interact with the display, Oat Foundry built a custom version of the standard web app with NEOPERL’s branding, which made it easy for anyone at the conference to walk up, type in their message, whether it be a name or saying, and take a photo with their friends in front of the display. 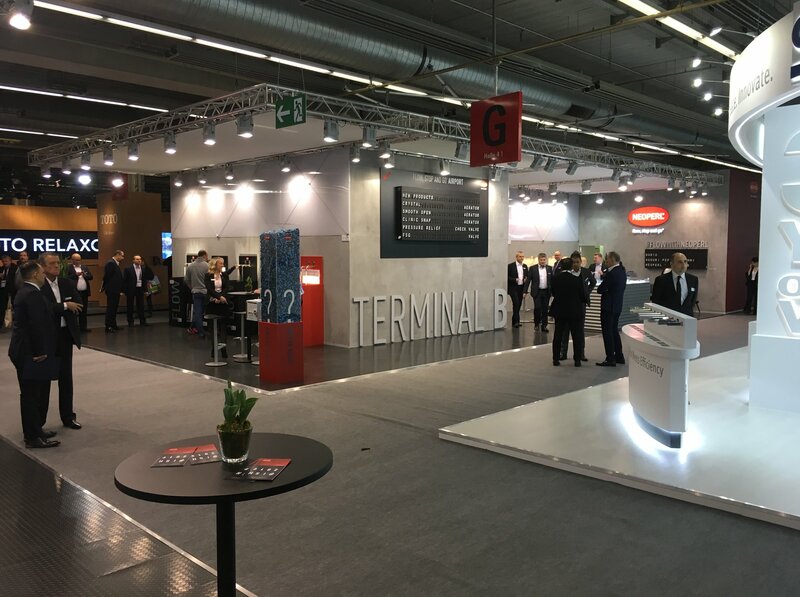 Through both Split Flaps, NEOPERL was able to communicate, inform and engage with visitors at one of their most important trade shows of the year, while also staying true to their booth’s overall travel theme. Split Flap Displays are a great way to inform and interact with guests at an event or trade show. Oat Foundry is happy to help you rent or customize a display to fit your needs. If you would like to learn more about Split Flap displays, contact us. We love building cool stuff, and we’d love it even more to build some of that cool stuff for you!